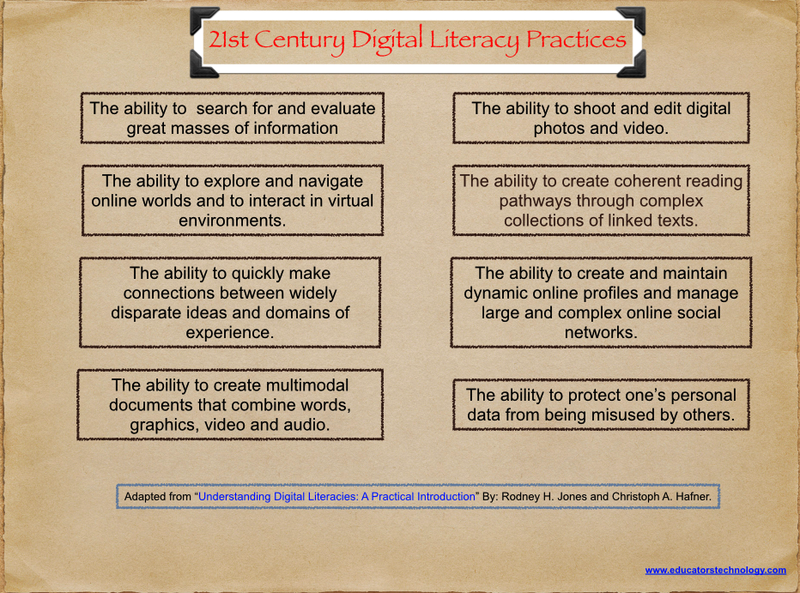 Theoretically speaking, digital literacy is a concept that is in constant flux. It is perpetually shifting and expanding to include new practices and skills afforded by new emerging technologies. In their excellent book "Understanding Digital Literacies: A Practical Introduction", authors Jones and Hafner provide a detailed analysis of what it means to be a digitally literate in the light of the social media revolution and the widespread of web 2.0 technologies. As I was perusing it today, I came across this section in chapter one where the authors talk about the different digital literacy practices that are required to thrive in this digitally-focused era. The ability to quickly search though and evaluate great masses of information. The ability to create coherent reading pathways through complex collections of linked texts. The ability to quickly make connections between widely disparate ideas and domains of experience. The ability to shoot and edit digital photos and video. The ability to create multimodal documents that combine words, graphics, video and audio. The ability to create and maintain dynamic online profiles and manage large and complex online social networks. The ability to explore and navigate online worlds and to interact in virtual environments.